Ewan declaring his love for Beverly and asking her to move away with him to Perth. Ewan says he's liked Beverly for years and that everyone knows that she and Jim are over. Beverly says she needs to think about it, she doesn't want to walk out of her practice, Ewan says she'll have a specialist practice in Perth and she can do as much research as possible. EWAN: Bev, I want you to be my wife, I love you and I always have. Beverly looks even more shocked. Josh, Cody and Melissa are served by Des who tells them not to be late for school. Cody wants to invite Melissa to do homework to allow her to see Todd. Melissa thinks Todd doesn't care any more. Todd enters and Josh asks him if he knows anything about Gary's arrest, Todd is quite defensive and says he doesn't know anything. Todd says he's grounded until he's paid for the damage to Dr O'Brien's car; Melissa wants to know where he was the other night (When he and Gary broke into the Bike Yard). Todd says he was out, Melissa doesn't believe him. MELISSA: Take a good look at yourself Todd. Melanie is constantly talking about dancing and annoying Paul. Matt tells Melanie that she doesn't have to drive him anywhere, Matt wants to talk to Paul privately, and Melanie falls over as she leaves! Matt says the person who is covering for Jim in the workshop is always drunk, it turns out that Paul didn't know that Jim was in New York, such a close family! 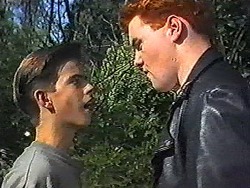 Matt tells Paul about Jim's troubles but Paul shouts at him but quickly apologises. Matt leaves for his lunch break. Des is clearing tables as Dorothy enters. 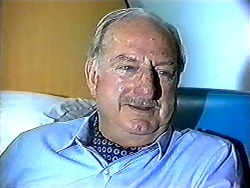 DES: Hello Dorothy, what can I get you? Can I call you Dorothy? Dorothy places a very specific order, Helen is at a table and asks Dorothy to join her but she has to go back to school. She invites Helen over later and Helen mentions that she is going to see Derek Wilcox later; she still doesn't know why he is in hospital though. 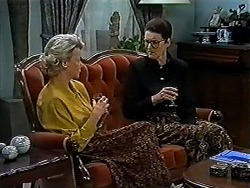 Helen admits she is fond of Derek, Dorothy says they'll talk over a sherry later. DOROTHY: Thank you, Mr Clarke. 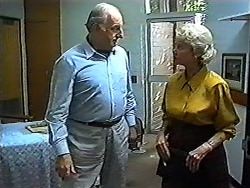 Matt and Melanie enter; Des tells them that Madge and Harold are out. A nice looking lady enters, Des and Matt admire her, Des bets Matt 10 dollars that he couldn't get a date with her; Melanie thinks they are being sexist. Matt approaches the woman and it turns out she is a customer and Matt his fixed her car which she will collect later. She is in Erinsborough for 2 days, but doesn't like eating alone, Des comes over. DES: Hey babe, ready to order? 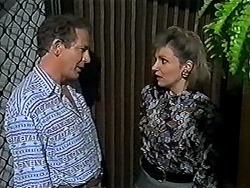 Miss Morrison ignores Des and agrees to go to dinner with Matt. Melanie hands over the money from Des. Two policemen are sat with Beverly when Todd and Josh enter. They want to know where Todd was the other night (when he broke into the Bike Yard). He says he was with Josh but Beverly interrupts to say he wasn't with Josh (nice one Bev). The Police say they know there was another person with Gary and they have a description. Beverly is unhappy with the police as they are treating Todd like he is already guilty. Todd then admits he was at the Bike Yard, the policeman says he could be in serious trouble. 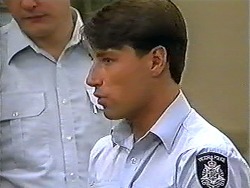 Todd and Beverly are back from the Police Station; Beverly is angry and says that Todd will be charged. Beverly says she will tell Jim when he is back from New York; Todd didn't know Jim was there either! Beverly says this is Todd's last chance and says he has to stay away from Gary, Todd promises he will. Helen visits and tells Derek about a new art gallery, Derek says he will be discharged soon. In reception, Matt and Melanie talk about his date, Miss Morrison is very rich and important according to Melanie. Matt says she is classy which Melanie takes offence to. Matt goes into Paul's office, Paul says he can't find another mechanic so the workshop will temporarily be closed but Matt will still be paid which pleases him. Paul says he needs to work in the hotel. instead though. 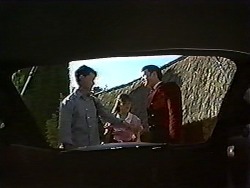 Ewan wants to take Beverly out but she wants to stay in to keep an eye on Todd, Ewan says it's not Beverly's fault and says she should send him back to his mother or boarding school. Beverly says she can't just get rid of him, she wants to talk to Jim and Ewan has a go at Jim. Ewan says he is going to Perth in a week, Beverly says she will let him know before then. Helen is leaving and says she might have a surprise for him! She then goes to speak to a nurse; she asks how long Derek will be in hospital for. The nurse says the prognosis isn't good, Helen looks upset. A car pulls up outside, it's Matt's date just as Matt walks out in his uniform! Miss Morrison tells Matt he looks quite young and the date is off. Melanie then reclaims her money from the bet! Josh is telling Cody and Melissa about Todd's problems with the police, they all think he is stupid. Cody says Todd could go to jail, Melissa doesn't think he will. Gary comes in and asks where Todd is, he doesn't seem concerned about Todd's arrest and threatens Josh, Des steps in and saves the day! Helen has discovered that Derek has an enlarged heart and needs a transplant but he isn't priority because there are younger people on the waiting list. Helen says she can't take it in, Dorothy says she was flippant earlier and apologises. Helen says she loves Derek. Todd is putting the rubbish out when Gary approaches him, it turns out that Todd told the police everything about Gary who is pretty annoyed. He says he is going to jail and grab's Todd. He says he's going to put Todd in Casualty as he grabs a plank of wood!